ePIXfab is the bronze sponsor of ECOC 2018 in Rome (Italy). Dr. Abdul Rahim gave a talk about Open-access manufacturing routes for silicon photonics: from prototyping to volume at Market Focus (ECOC 2018). More details HERE. 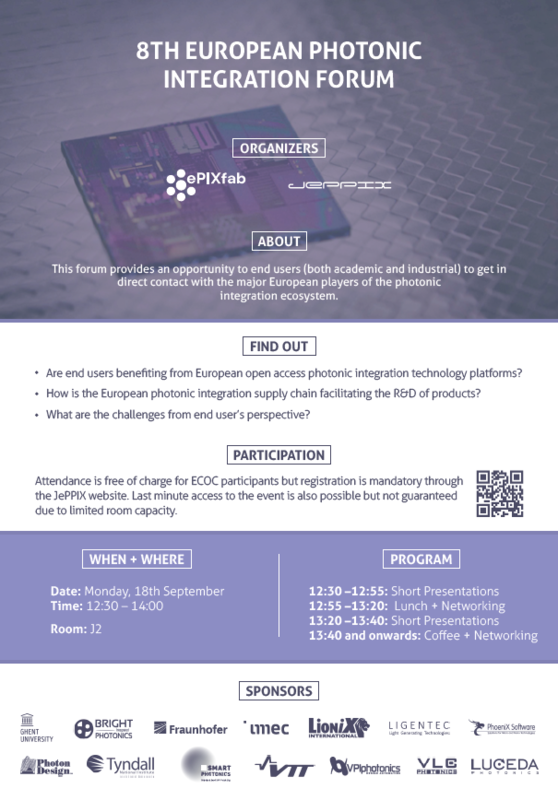 ePIXfab is presenting an overview of silicon photonics platforms in Europe at European Conference on Integrated Optics (ECIO) in Eindhoven (The Nederlands). Click HERE for more details. ePIXfab is supporting 10th Annual PhoeniX software training from 20 to 24 February 2017 in Enschede, the Netherlands. For more details click HERE . ePIXfab represented European Silicon Photnoics activities at Fiber Optics Expo 2017 in Japan. Click HERE for more details.